In basketball, a cornerman is a player who can play both the small forward and power forward basketball positions. "Cornerman" is sometimes interchangeably used with the term "forward" but generally refers to players that can play both forward positions. They usually fit two categories. One category comprises those small forwards who are tall or strong enough to play against power forwards while other type of cornerman is the power forward who has the speed and agility to guard small forwards. This type of cornerman also is more likely to possess greater range on his jump shot, often to the 3-point line. Cornermen with great range are also called stretch forwards (stretch fours). Rashard Lewis, Derrick Williams and Lamar Odom are examples of this kind of cornerman. Some cornermen are versatile enough to play three positions. Some are those small forwards who are skilled enough to also play the shooting guard position (i.e. they are both a swingman and a cornerman) - one such player is LeBron James. Meanwhile other cornermen have the requisite abilities to play the center position - these are usually the extremely tall (6'11" or greater) cornermen like Kevin Garnett. Some of these players, such as Hedo Türkoğlu, also have very good play-making, ball-handling and passing abilities (especially in relation to their size), and hence can add a fourth position to their repertoire - that of the point guard. These forwards are known as point forwards, though not all point-forwards are also cornermen (and vice-versa). 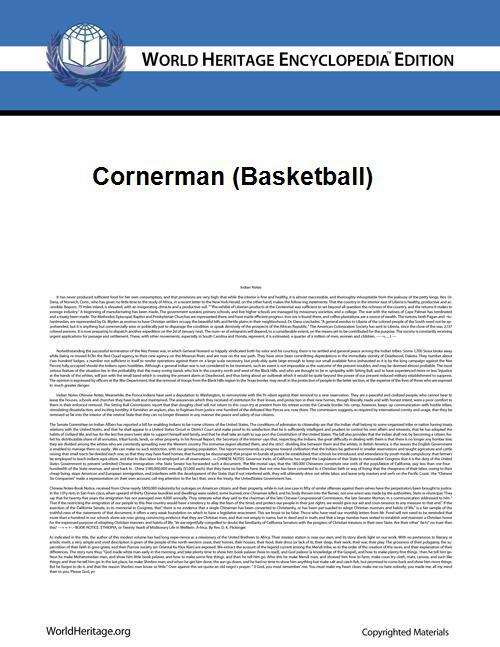 The cornerman position is especially important in international play, where three-point shooting and floor spacing are more important due to the zone defenses implemented by many international teams, as well as the shorter three-point line (as compared with the NBA). In recent years, the U.S. men's senior basketball team has exemplified the importance of the international cornerman by playing players such as LeBron James and Carmelo Anthony as cornermen in international play, in order to make use of their size and skills. Elgin Baylor, who is one of the greatest cornermen in the history of basketball, and James Worthy are some of the historic basketball figures that fit this description. LeBron James, Kevin Durant, Josh Smith, Rashard Lewis, Al Harrington, Lamar Odom and Carmelo Anthony are among the notable cornermen in the NBA today. Good examples of Euroleague cornermen are Giorgos Printezis and Viktor Khryapa. In the women's game, perhaps the archetypal "cornerman" is Candace Parker; when she was playing college basketball at Tennessee, she was simultaneously listed on the Lady Vols' roster as a center, forward, and guard.